I work for the Joint Cross-Domain eXchange program (formerly OED), which represents evolutionary technology to protect data at its proper security level. JCDX runs on Red Hat's v.6 Security Enhanced Linux operating system. It is the first of its kind and is gaining serious interest around the world. There are plenty in 'the other camp' that make claims that their technology (such as CDS GCCS or DTW, etc.) manages data at the appropriate security level. The true answer lies in how data is received and protected for the lifetime that it resides on the filesystem. JCDX labels data at its appropriate clearance level when first received and maintains it indefinitely. When operators attempt to access the information, their profiles and applications must meet or exceed the minimum clearance or they will not be exposed to that level of data. Multi-Level Secure systems retain the data at the original level. In contrast, Multiple Security Levels (MSL) GCCS-R/M combinations lose the original fidelity and pedigree of the information and strip out valuable data when sanitized to lower levels. A further false statement spread by some US decision-makers are that their multiple, single-level systems and associated guards represent a cheaper, more unified solution. JCDX resides on a single server and provides a full suite of intelligence fusion capabilities. 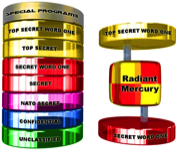 GCCS-R/M requires a separate message handling suite (at multiple levels) that cannot handle some classified programs and cannot share and protect information at the same time. Event-By-Event means that as information is ingested by JCDX, it can trigger pre-programmed events to automatically generate (encode) a message to distant subscribers, keeping them informed of the intelligence picture. JCDX is further rendered flexible by allowing Lua to tweak incoming/outgoing data to match a subscriber's particular attributes without skewing the data for everyone. JCDX excels at communicating across the spectrum of formal record messages and technologies (serial, network, etc.) and most importantly, handles communications between the US and other nations securely with the greatest of ease. in today's world, no one's military is as strong as a coalition of like-minded militaries that can share and operate off of the same battle plan. No other system on Earth can accomplish this with the same degree of efficiency and protection of data, sources and overall speed. Thanks to the Red Hat O/S, it's a breeze to integrate multi-level web databases for our operators. There is so much rich ability to generate scripting & web content, that no other C4I system can come as close with such innate flexibility. With excellent products such as Open Street Map, JCDX benefits from having an active 'Google Earth' functionality with no commercial cost. We are able to generate our own mapping based on requests from our user community and external users on the same network can benefit by seeing the Intelligence Picture from the comfort of their non-JCDX workstation. What's better than an online encyclopedia of shipping and a live track database? Both that are stitched together! Analysts can select a track on their screen and immediately browse the 440k ship photograph database and all of the IHS FairPlay attribute data on each vessel without having to search for it. JCDX maintains both databases linked to entries in the track database. If a unit is deleted, the information remains in the Content Database. If the track returns, the link is already there.